So, you were sitting under the Sorting Hat as it dispelled its rhyme, trying to place you into a house. It seemed to debate a while: Gryffindor or Hufflepuff? Gryffindor or Hufflepuff? But you know the Sorting Hat takes into account your feelings, as well as your qualities. Everyone wants to be in Gryffindor, it's almost cliche. Sure, you're certainly brave and determined. But in the end, you wanted to be a Hufflepuff, and a Hufflepuff you became! Hurrah! While often overlooked, Hufflepuffs are bright spots in a darkening world—they are fair and non-elitist, kind and loyal, and good with plants and food. What's not to like? We think you got sorted right where you belong. But wait, you can't waltz into the Badger common room in jeans and a T-shirt! You need this Adult Hufflepuff Skirt to fit in during your first days at Hogwarts. 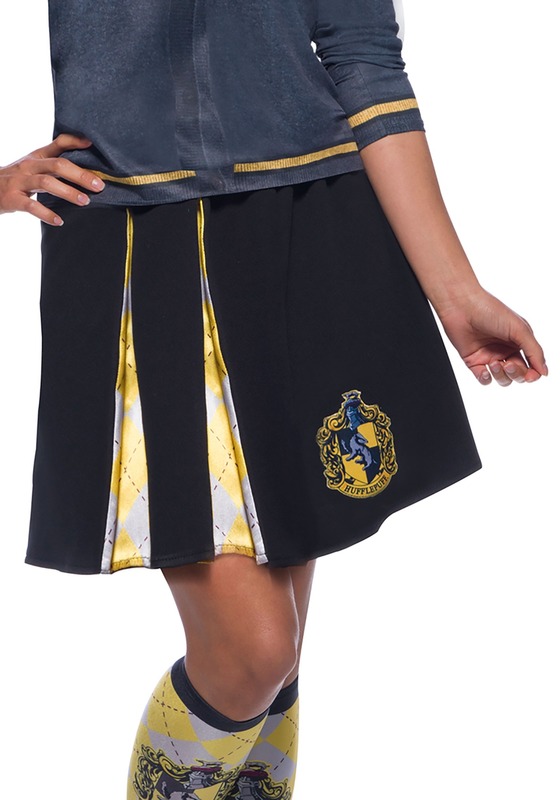 It has your house crest and colors, and it will pair perfectly with other Harry Potter Hufflepuff accessories—school robes, socks, a necktie, or a scarf—for a first-semester look worthy of a feast in the Great Hall! You look ready for your classes and all the magic that will happen here at Hogwarts. We're glad you asserted yourself to the Sorting Hat and opted for the road less traveled. We think you're going to be a great and powerful witch!